The British media have turned the Labour Party’s alleged antisemitism problem into a national crusade. Meanwhile, leading Tories this week openly associated themselves with the Ku Klux Klan and the ideas of Anders Breivik — and the media shrugged. 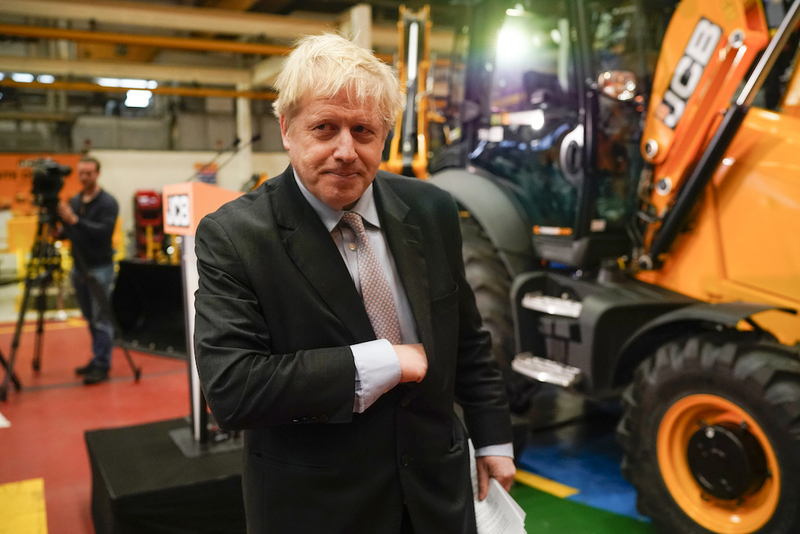 Boris Johnson on a visit to JCB World Headquarters in Rocester, Staffordshire on January 18, 2019. As I’ve noted previously, the UK’s Conservative Party is mired in an Islamophobia problem that it refuses to acknowledge. This week, many Conservative party members and members of Parliament were caught using explicitly racist terms, yet the issue was largely shrugged off by the media. The terms were openly racist and antisemitic. The stark difference in the media’s treatment of the Conservative Party and Labour is particularly visible after the incidents this week — had any Labour MP said what numerous Tories did, an aggressive media onslaught would have been inevitable. Instead we saw journalists caveating their reporting of the terms the Tory MPs used. On Monday night, BBC political editor Laura Kuenssberg tweeted that the band of MPs who visited Theresa May for an emergency meeting had taken to calling themselves “Grand Wizards.” Twitter instantly pointed out that the term is used by the Ku Klux Klan. Even former Tory chancellor George Osborne asked, “I’m sorry, is this for real?” But there was little blowback apart from Twitter consternation, which passed quickly. On Radio 4’s Today, a morning political program, a presenter used the term “Grand Wizards” casually on Wednesday, with no reference to its Klan links. That the Tory group didn’t know is entirely unlikely: more likely they didn’t realize the name would leak to the press. On Tuesday afternoon, at a meeting of the Conservative-aligned, Bruges Group, MP Suella Braverman told an emergency meeting on Brexit, “We are engaged in a war against cultural Marxism” and warned about free speech at universities in the UK. After the speeches, as the microphone was passed around for questions, I challenged her use of the term, pointing out its antisemitic history, and the fact it was a key theory for mass murderer Anders Breivik. She doubled down on her use of the phrase: “Yes, I do believe that we are in a fight against cultural Marxism. We have a culture evolving from the far left which is about snuffing out freedom of speech… It’s absolutely damaging for our spirit as British people and British genius… I’m very, very worried about this creep of cultural Marxism that has come from Jeremy Corbyn.” Braverman’s office was asked for comment on her use of the term, but remained silent. The term has long been considered anti-Semitic; the word Kulturbolschewismus was widely used in Nazi Germany, and by Hitler, to denounce modernist culture. “Cultural Marxism” is now the preserve of the far and alt-right. It remains to be seen where Braverman discovered the term, whether she knew about its antisemitic connotations, and why she chose to use that term in particular, at that event. As another journalist pointed out, though the link to Anders Breivik and the far-right was pointed out to her in my question, she doubled down on her use of it. The Board of Deputies, the most senior Jewish organization in Britain, issued a statement condemning Braverman’s use of the term, calling on her to clarify her comments. If Braverman initially thought the phrase was benign (and her constant use of phrases like “war”, “battle”, “under attack” suggest that was not the case), by the end of the event she had been confronted with the term’s history, and later in the day criticized by the Board of Deputies. Labour MP Wes Streeting said, “Members of Parliament should know better and she should apologize immediately or the whip should be removed.” Anti-fascist campaign group Hope Not Hate added: “This is deeply disturbing and disappointing language to hear from a Conservative MP. In fact, it’s worrying that a mainstream politician would even have heard of such a phrase, which is usually championed by those on the extreme right.” By this point it was impossible to deny that Braverman had been made aware of the meaning of the term, or that many were asking why a sitting member of Parliament was spouting an antisemitic conspiracy theory. Yet there was almost no furor surrounding either of these incidents. Blatant examples of racism were swept under the rug. Columnists, crying censorship, rushed to excuse the term, which had been used extensively in their newspapers and magazines. While Labour was routinely savaged in the press for comments anonymous accounts had made on Twitter, Tory MPs have the luxury of being openly racist with absolutely no consequences. The disjunction between how Labour is treated by the media, and how the Tories are has never been more stark than it was this week. The Tories continue to behave this way because they know they can. Boris Johnson, one of the members of the “Grand Wizard” group, faced no reprimand from the Conservative Party for a column that compared women in burkas to “letterboxes” and “bank robbers.” Corbyn will be condemned for the slightest perceived deviation from the norm, yet the Tories can be openly racist. There is a reason increasing numbers of people have stopped relying on traditional media for news and turned to alternative outlets — and this week showed why.